I’m thrilled to introduce this new, unique Tupper Tote Bag. 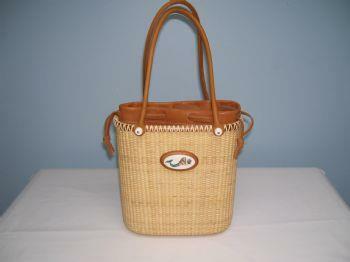 This Nantucket Lightship basket stands 9 inches high, 8 1/2 inches long, and is 4 inches wide. It is woven with cane staves and cane weaver. The rim and base are made of cherry wood. The camel colored leather handles are 24 inches long. The front of the basket is adorned with a cherry wood plaque and scallop shell carving or your initials.